Right, so a few of you took up the challenge and submitted a list of puzzles that you thought you’d spotted in my Christmas collage ... 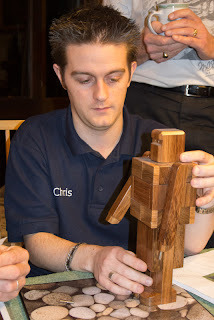 Kudos to Chris for not only submitting the fastest entry, but also for correctly spotting 40 out of 42 puzzles. Ali correctly named 37 of them (are you kicking yourself for not spotting the Orange Revo, mate?). ...but the winner of my little Christmas giveaway is Rob Stegmann – who not only was one of the very first entries, but also had every single puzzle correctly identified... so a(nother?) slice of Karakuri Cheesecake shall shortly be winging its way across the pond to you, sir! 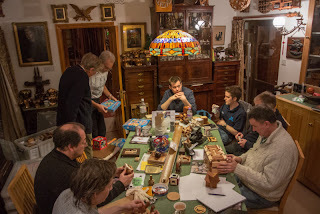 Wasserhahn [Roger]; Geburt [Roger]; A Plugged Well [Brian Young]; Stellated Improved Square Face [Scott Peterson]; Louis' Amazing Box #3; Hex Stairs [Derek Bosch]; Will Strijbos’ Lotus; Owl in Cage; Brian Young's Washington Monument; Burrblock [Jerry McFarland]; James Dalgety's Pythagorean Puzzle; Eis [Roger]; The Chris [Eric Fuller]; Cerradura 3D [Robrecht Louage]; Judge's Gavel [Mike Toulouzas]; First Box [Wil Strijbos]; Revomaze Orange [Chris Pitt]; Washer Cylinder [Wil Strijbos]; Exchange [Wil Strijbos]; Superstrings [Richard Gain]; Stickman Milestone Puzzlebox [Robert Yarger]; Flemin' [Tajima]; Jugo Flower [Wil Strijbos]; Rubik's Tangle; Oskar's Domino Tower; 4D [Oskar]; Breadbox [Dave Litwin]; Slidy 7.a.1 [Van der Zon]; Tantalizing [Yee-Dian Lee]; Box With a Tree [Iwahara]; James Dalgety's Round Dozen; Marcel Gillen Bolt; Four Colour Map Puzzle; Peppermint Twist; R2D2 [Roger]; Jos Bergmans’ Sun; Stickman Checkmate Puzzlebox [Robert Yarger]; 3-layer Tetraxis [Jane Kostick]; Marcel Gillen Knight; Pearl in the Shell [Bill Cutler]; Alcyl [Iwahiro] and The Heather by Eric Fuller. ...this year came from Louis, my a-maze-ing Dutch puzzle-buddy - he thought it would be fun to come up with an impossible Christmas card so put his mind to it after his kids had had their visit from Sinterklaas and came up with this stunning design with a Christmas Tree and a star on it - definitely the most puzzling card I got this Christmas - thanks Louis! At the Dutch Cube Day I was fortunate to be able to collect a couple of Cola Bottles that Wil Strijbos had made up specially for me ... I’d mentioned that I was missing #5 a little while back after I’d had a go on Nigel’s copy at our last Warwick MPP and Wil had rather kindly offered to make one up for me. Wil had brought a crate of Cola Bottles along to DCD including a couple with names on them and one of those was a #5 for me ... and then hidden away in one of crates – so well hidden in fact that it took the best part of the day to unearth them, he’d also made up a couple of #7Bs ... so I took a copy of that as well. 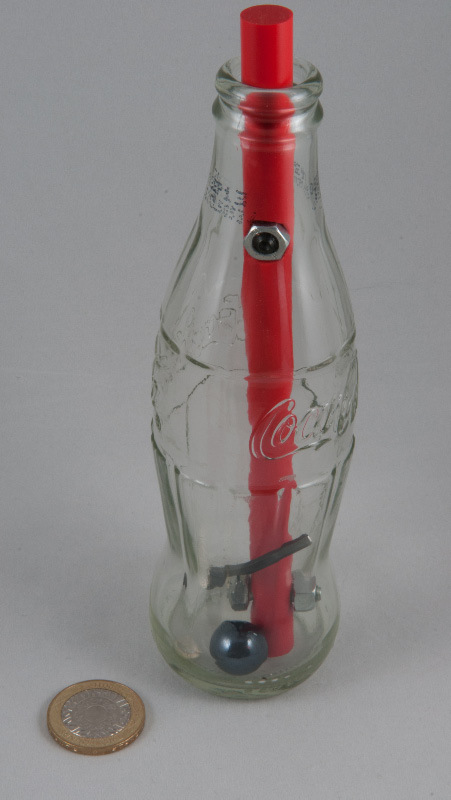 Wil’s Cola Bottle #5 is easily recognisable as a Strijbos puzzle from the classic red stick and his trademark shiny silver-grey marble rolling around the bottom of the bottle. There’s a vanilla-looking nut and bolt down toward the bottom of the stick and a pair of nuts threaded onto a rod through the red stick toward the throat of the bottle ... and there’s a hex key rattling around in the bottle. Some serious close up inspection will show something that you’ve probably not noticed until now, and then you’ll need to apply the little grey cells to work out how to make use of that, discovering along the way that Wil’s been a bit sneaky about exactly how he’s provided those tools for you – so they aren’t quite as useful as you might prefer. 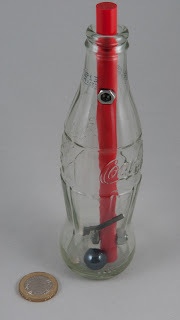 It’s a great bottle puzzle and everything is there for a reason – nothing is superfluous – there’s a bit of dexterity involved in getting things positioned just right but I found that this combination of tools actually makes putting it back together again a lot easier than some of the other Cola Bottles. 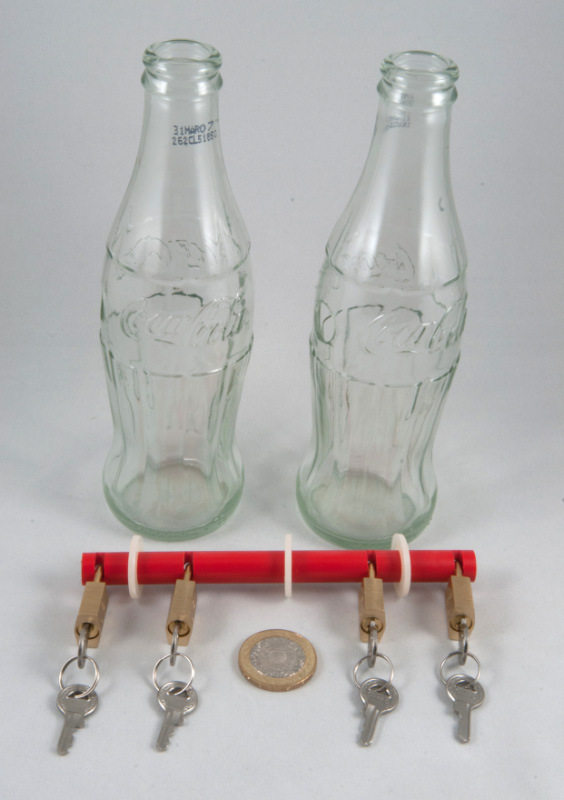 Wil’s Cola Bottle #7B is an extension of Cola Bottle #7 which has a red stick through the middle of the bottle with three padlocks locked onto the stick – one inside and one either side of the bottle. 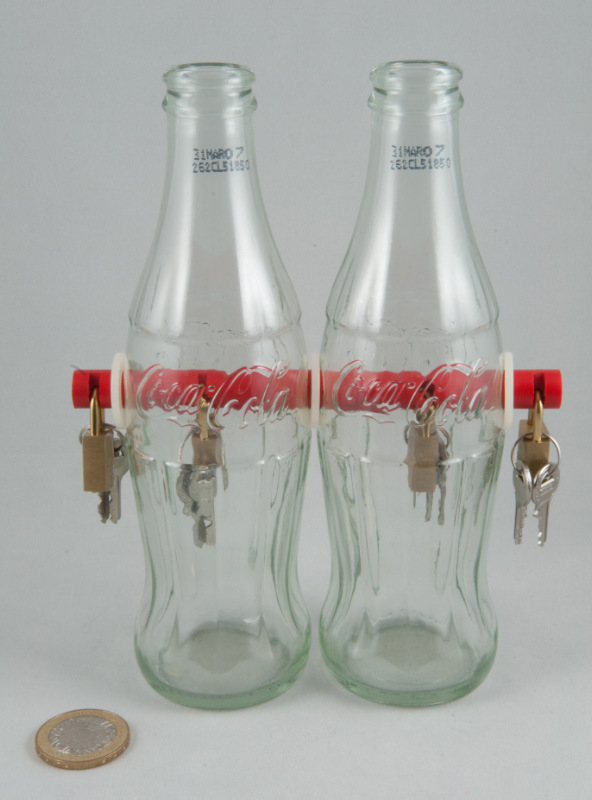 There are keys dangling from each lock, but the outside keys will unlock the inside padlock and vice verse. Cola Bottle #7B extends this to two Cola Bottles joined by a single red stick with four padlocks: one inside each bottle and one either side of the pair of bottles ... and again the keys are all in the wrong places to be useful. This one’s a bit fiddly, but the required manoeuvres aren’t too tricky. You might need a little trial and error to work out which outside keys open which inside locks, but you’re only ever going to have to go through the process once too many if you’re unlucky. Definitely not the trickiest of Wil’s Cola Bottles, but it certainly has good presence on the puzzle shelf. The rod duly arrived, sans holes indeed, so I transferred the ones off the old rod and everything is all back together again once more. Thanks Wil. 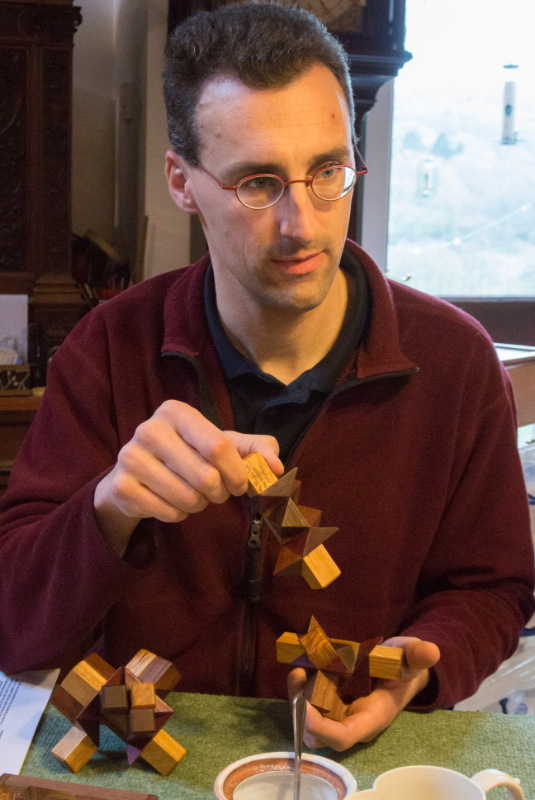 Brian Young’s IPP32 exchange puzzle is a brute of a puzzle! If you’ve solved it (properly! ), give yourself a pat on the back – this is a thoroughly devious puzzle. Brian’s description points out that there’s red, white and blue on the flags, and there’s a white (Queensland Silver Ash) monument on a red (Western Australian Jarrah) base – and all you have to do is find the blue inside, and then relock the puzzle as you found it. Helpfully his description goes on to point out that this is an incredible scale model of the real Washington Monument, right down to the (removable) lightning rod at the top. 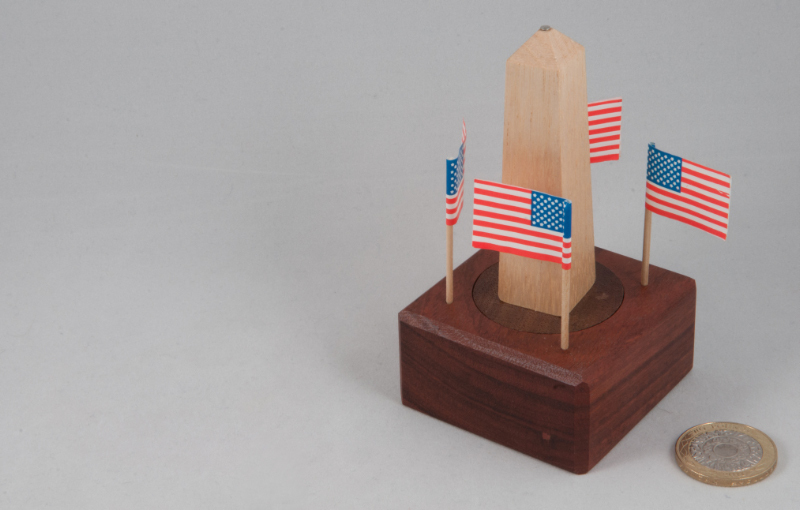 A pretty cursory examination of the puzzle shows the monument is set on a circular section of the base and it will rotate reasonably freely – until something jams up against one of those flagpoles – cured by a bit of jiggling and it rotates once more – until something jams up against one of those flagpoles – repeat until bored... it may be therapeutic, but it won’t solve the puzzle for you! Handily the flagpoles all come out leaving four little peepholes into the base ... and as you’d expect, now the monument turns freely and every now and then you can find something shiny whizzing past one of the holes while you’re turning the monument around ... OK ... so we know there are some pins that are keeping the base attached to the monument – and there seem to be quite a few of them. You can hear them rattle if you shake it. 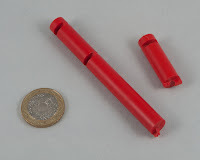 Right, so some sort of pins radiating out from a central point – we’ve seen things like that before, haven’t we? Gotcha! OK, so it’s not quite that simple... probably wouldn’t have been, given that it’s one of Brian Young’s (aka Mr Puzzle) creations. Round about now I started experimenting with some pretty weird ideas – and I play for quite a while before I eventually manage to release the monument and find myself staring at one of the strangest mechanisms I’ve ever seen in a puzzle ... and I stare at it for quite a while trying to work out why it’s just done what I think it’s done – only my brain keeps telling me that it’s just violated a couple of fundamental laws of physics – and my brain doesn’t like it when that happens ... so I think some more, and play some more – and to be honest the confusion merely mounts! Add to that I’m starting to think I’ve gubbed it... So I do the only thing a puzzler in my condition can do – I phone a friend, who’s solved his already and beg for the explanation so that my head will stop spinning at these fundamental violations it keeps coming up against ... and when he tells me, it all slots into place: you’ll be glad to hear that the fundamental laws of physics haven’t been so much violated as temporarily suspended – remember these puzzles were manufactured in Oz! OK – so having opened it (properly) – closing it is non-trivial, in fact you’re going to find it’s now locked open! Locking it up isn’t simply a case of reversing the process – Oh no – that would be way too simple! You’ll need to come up with a strategy, find the tools to implement it and then close it up again... remember it’s a sequential discovery puzzle! 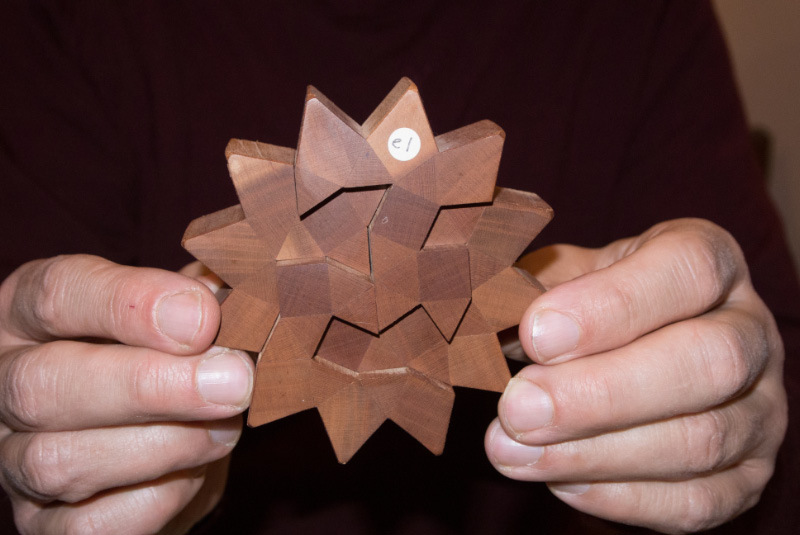 This is a really incredible little puzzle that incorporates a mechanism I’ve never seen in a puzzle before (I’m still new to this – be gentle!) – it’s a really clever mechanism and I suspect that we’ll see it appearing in some or other guise again in the future – it’s simply too good an idea not to use again! Last Saturday morning I found myself driving around some dodgy back roads outside of Bristol in search of an international airport ... you’d think I’d know better than to blindly trust my sat-nav in this country by now – it assumes that all roads are equal and has no idea that you might not choose to drive at the maximum permissible speed on a particular road because it’s pretty narrow, surrounded by thick hedgerows and has several rather wide farm vehicles on it! Anyhow – it DID eventually manage to get me to Bristol International Airport at the right time so I was able to collect Louis fresh off his flight from Amsterdam on his latest puzzle pilgrimage ... we were heading to Devon – a day-trip to James Dalgety’s fabled Puzzle Museum. I chose to ignore the sat-nav’s directions for most of the way from the airport, much to Louis’ amusement ... “Nope, never been this way before, but I am not turning right up that little road.” The sat-nav did eventually pick up the “right” road and got us safely down to James’. On arriving at puzzle heaven, Percy gave us a rousing welcome (or a stern warning – it could have been either) – but he soon smelt Ben and Jerry on my jeans and we became the best of mates again. Inside I handed over Gill’s contribution – a tin of homemade doughnut muffins – to Lindsey and we made our way through to the grand puzzle room to find Joe and Rich already deeply puzzled – they’d arrived a bit earlier than we had, and had already had a quick tour and been presented with their first challenges – Rich was deeply engrossed in a wicked-looking six-piece burr (that he conquered soon after). Chris and his dad arrived a bit after us and then Simon arrived with James-the-younger in tow – it was great to see him in such good form after his health scare over the past few months... hopefully a little puzzling and some friendly banter will help the recovery process! Revitalised from the journey south with a good cup of coffee, we soon fell among the puzzles, bringing out all of our recent purchases in the hopes of having something that James-the-elder hadn’t seen before (far harder than it may sound!). Laurie arrived in full force and began dispensing puzzle challenges to all and sundry in between rousing bouts of banter interspersed with some truly dreadful puns – which I suspect are a source of pride (and rather amusing in spite of the groans we felt required to express :-) ). 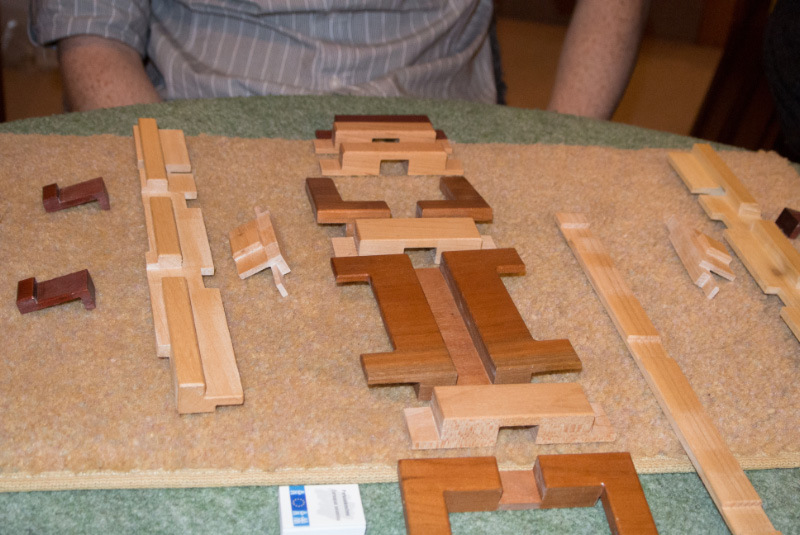 Chris had brought his copy of Mike Toulouzas’ latest creation (“Illusion Puzzle”) along – he’d snagged a copy on Puzzle Paradise within seconds of it being listed and was very chuffed with it ... he’d been telling us about it for a while – about how he’d been playing with it and had it come apart into six pieces with no hope in heck of being able to recognise where each piece had come from – and then spent days and days trying to put it back together again – most times finding an assembly that worked fine for the first five pieces, but wouldn’t allow the sixth piece in... he’d eventually managed to get it back together again in time to bring it down to James’ - so Louis did the obvious thing and promptly disassembled it over a cup of coffee, and then (relatively) calmly proceeded to put it all back together again. James brought several original Coffins out to play, from a “simple” four-piece puzzle to a set of very typical Coffin-shaped pieces that James challenged me to build a symmetrical shape with – with no idea of the eventual shape I didn’t manage to produce anything vaguely symmetrical (perhaps that’s one of my puzzle blind spots!) – Chris had a bit of a go at it and did only slightly better than I did, before we were both showered with abuse by our host for our feeble attempts ... so we did the obvious thing and gave it to Simon who promptly completed it in mere minutes and was then given several further challenges with the same pieces that he duly completed as well... next time I’ll surreptitiously pass it to Simon far earlier in the process – clearly he is way better at puzzles than I am! Lindsey supplied an absolutely terrific spread for lunch that saw virtually every single one of us going back for seconds ... and the mince pies and muffins afterwards went down a treat as well. Somehow we hadn’t managed to eat enough at lunchtime, so offered the choice of a fish supper from the local chippie or more of the same, we unanimously elected to have another go at Lindsey’s spread for dinner – and it was mighty fine the second time around as well! During the course of the afternoon Joe and Louis asked to see James’ collection of impossible objects and impossible folding cards as they’d both developed a bit of a liking for them and had been doing quite a bit of their own experimentation – some of which made it to IPP32, just in case you missed that! 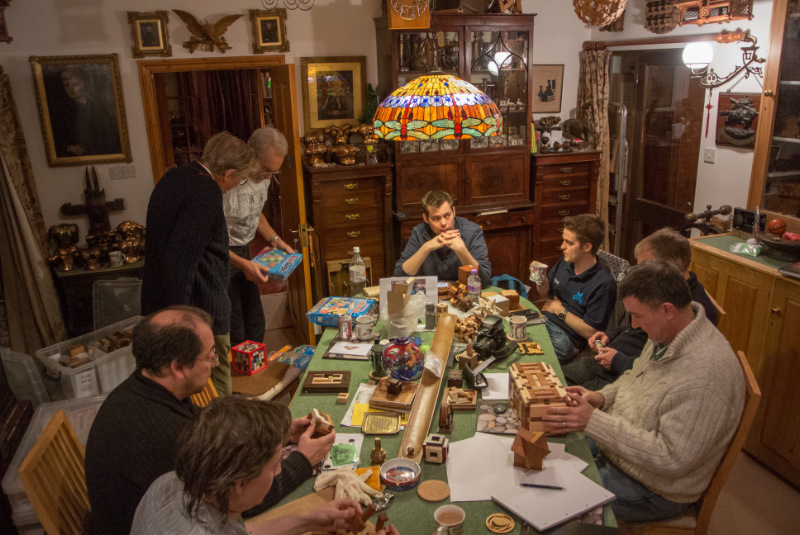 After a brief root around they returned to puzzle central with a copy of Allen Rolfs’ legendary tome on the topic and several examples that James had played around with himself ... followed shortly after by the production of a 12-card burr from one of his cabinets ... we’d all seen (heck, made!) 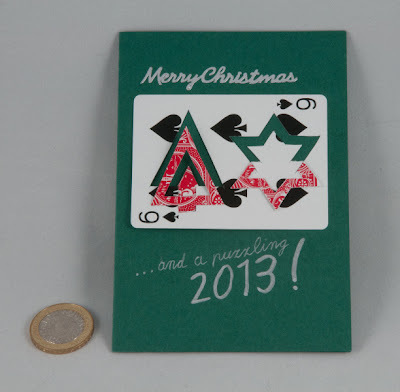 the classic three-card burr, but this one had four parallel cards in each plane – someone has incredible skill and a lot of patience to get that all right. James plied Rich with several burrs – most of which were returned fully solved, before he asked if he could have a go on James’ Borg Box. 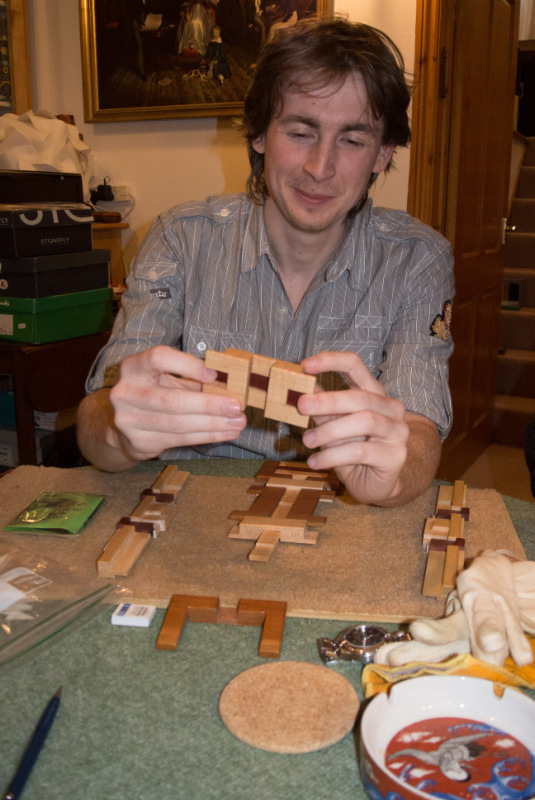 This legendary Stickman box is a decent challenge as a puzzle box to start with, but when you realise that Rob’s made it entirely without any glue, screws or nails, and each of the panels on the box can be removed and entirely dismantled – it instantly becomes pretty darn epic! It didn’t take Rich very long to work out how to make progress (he’s a bit of a whizz!) and soon enough he had one side open, then the other, and then he removed one of the panels altogether – to gasps from the assembled puzzlers – we’d been talking about the fact that Rob made it clear that if anyone fully disassembled their Borg Box and couldn’t put it back together again he would reassemble it for them at a fee because it was such a tough challenge, even when you know what you’re doing! With just a little bit of goading from us (although in fairness he probably didn’t need that!) Rich promptly disassembled the top of the box into many, many pieces... and it has to be said that at this point, not even James tried mixing up the pieces as he is wont to do on occasion. 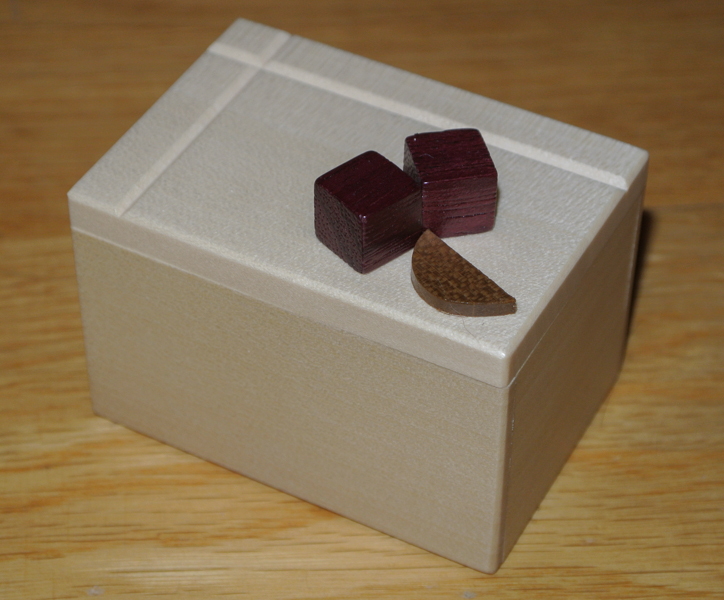 A few minutes later he’d rebuilt the top of the box, replaced the lid and closed it all up again ... I had a go at it and managed to work out the main elements of the locking mechanism and get it about half open before I retreated and closed it all up again. 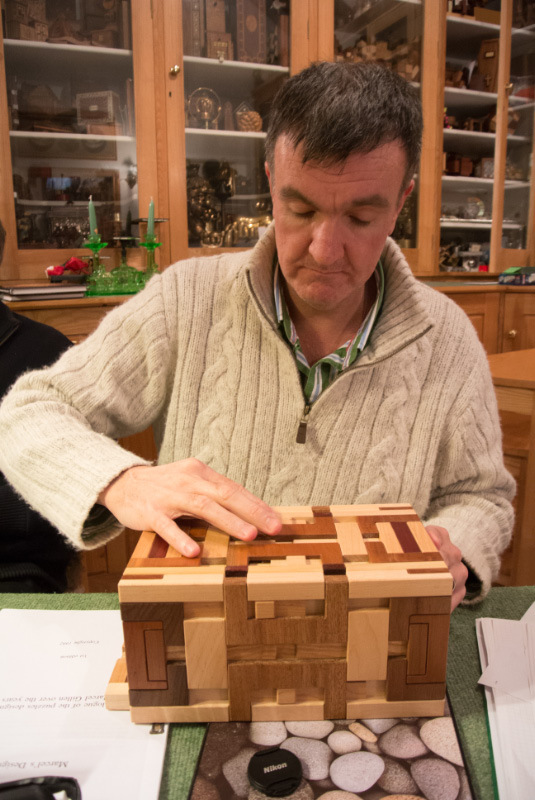 It really is an epic puzzle box and I think we’re all rather fortunate to have someone like James who’s so happy to share all his puzzles with anyone who’s interested. 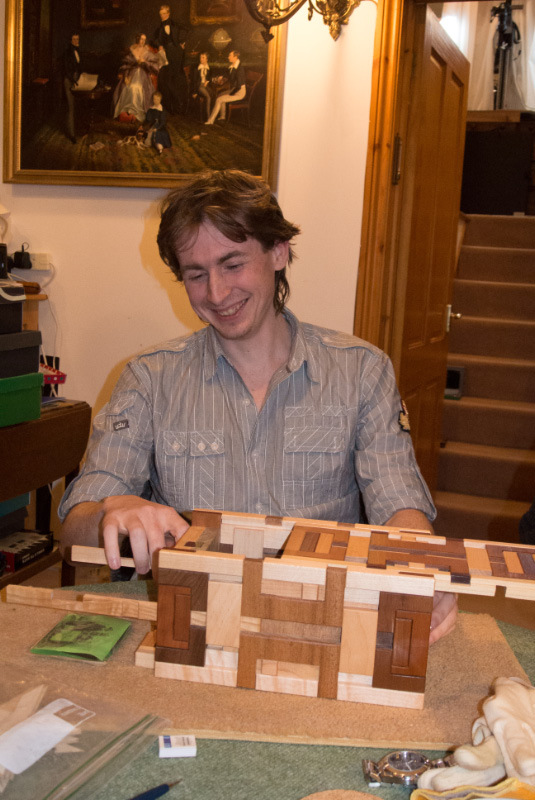 Speaking of things Stickman, Chris hauled out James’ Fulcrum Box which he’s always had a bit of a soft spot for to show his dad ... and Phil duly fiddled around and opened both compartments – with a large smile on his face – I think he likes it as well. 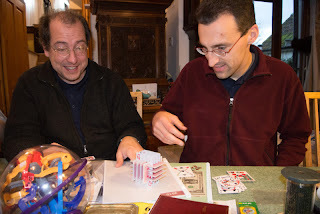 Inevitably Rich asked for a Berrocal to play with and Romeo and Juliet was brought out for a round of puzzling – he had a great time pulling it to bits only to have someone mix up the bits in front of him (hey, it’s only fair – James did exactly the same to me!) and then reassemble it with the compulsory cotton gloves to give it a bit of a clean in the process. Reassembly may have had a couple of false starts where Rich got all the way to the end to find one or two pieces still outside that needed to be inside, but he still put it back together again way faster than I had! 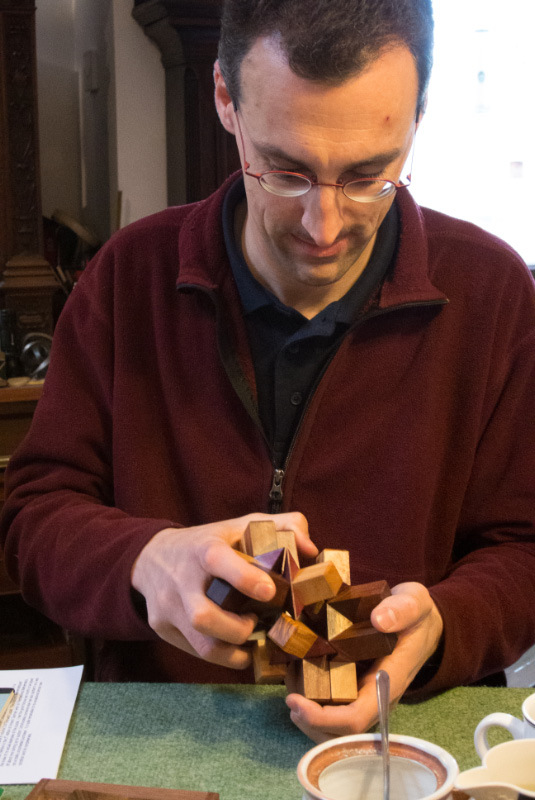 James-the-younger worked his way through a number of the more unusual Karakuri boxes and Chris hauled out Eric Fuller’s Tier Box again ... and this time I stayed away from it having been thoroughly humbled by it on a previous visit. As always James was indecently generous, not only having provided us with as many puzzles during the course of the day as we could manage, feeding and watering us all day, but he also gave each of us a puzzle or two from his pile of swaps to take home – Thank you James, for another incredible day – you sir, are an absolute gentleman!